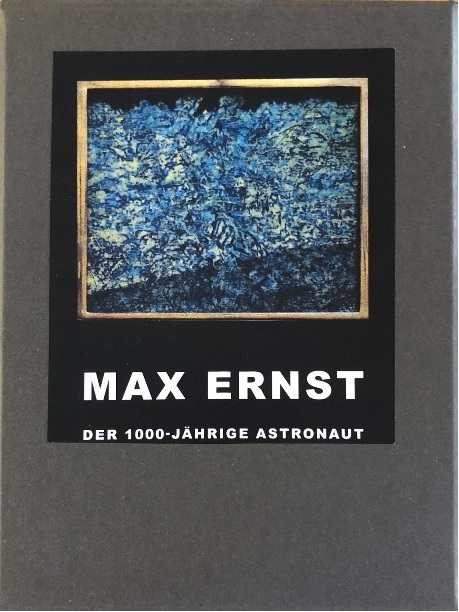 Max Ernst: Der 1000-j?hrige Astronaut. Die Sammlung Schmidt. LUXURY EDITION: 14 COPIES + PHOTO! Author: Ernst, Max - Schmidt, Manfred [introd.]. Title: Max Ernst: Der 1000-j?hrige Astronaut. Die Sammlung Schmidt. LUXURY EDITION: 14 COPIES + PHOTO! Description: Stiff pictorial wrappers (softcover), 28 x 21,5 cms., 143, (1) pp. throughout illustrated, principally in colour, bibliography, index, containing the 14 photo's edited together with the luxury edition. Note: Edition: 14 copies, housed in cardboard box with title + illustration on sticker mounted on the lid of the box. Book contains sticker with number of photo + the collector's stamp including date of publication. ADDED: cardboard portfolio, 44,5 x 33 cms., containing an original colour photo depicted in the book, 23,5 x 24 cms., by Karlheinz Bauer (1925-1976).